Wernigerode castle is a historical landmark of its German namesake city, which is located in the Harz Mountains a declared National park. Wernigerode castle dominates the German town from its hillside covered with thick forests. 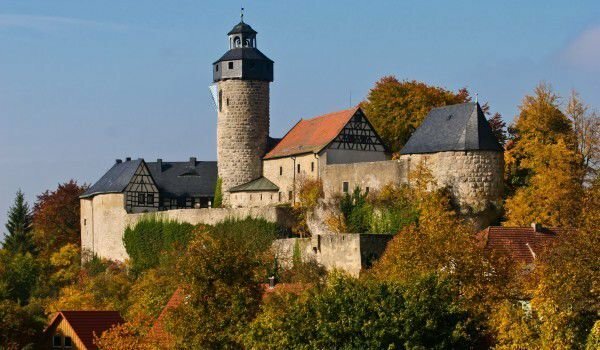 It is located in Saxony-Anhalt, and today is one of the most visited tourist attraction in this part of Germany. Many liken this medieval castle the world famous Neuschwanstein Castle, but unlike the palace of Disney, Wernigerode has a longer history. The castle was originally erected as a protective fortress to ensure the safety of German emperors during their hunting vacations. In the 16th century it was rebuilt as a castle in the Renaissance style. During the 30-year war it suffered severe damage and during the late 17th century is fully reconstructed. At the time Count Ernst zu Stolberg brings baroque elements into the construction of the castle and contributes to the atmosphere of a romantic place. . It is believed that the most significant restoration was thanks to Count Otto zu Stolberg who turned the castle into a model of Northern Germany historic buildings. Otto became president of the Prussian province of Hanover in 1867, which transformed his career. The impressive Wernigerode castle was opened to the public in 1930. There are organized tours, during which visitors are able to look at the 40 bedrooms and living rooms, which are authentically furnished in the spirit of European noble ways. The castle also has several permanent exhibitions of paintings and art objects.